Chipworks » Blog Archive » Samsung’s 3x DDR3 SDRAM – 4F2 or 6F2? You Be the Judge..
« Common Platform Goes Gate-Last – at Last! Samsung’s 3x DDR3 SDRAM – 4F2 or 6F2? You Be the Judge..
We recently acquired Samsung’s latest DDR3 SDRAM, allegedly a 3x-nm part. When we did a little research, we found that the package markings K4B2G0846D-HCH9 lined up with a press release from Samsung last year about their 2 Gb 3x-nm generation DRAMs. My colleague at Chipworks, Randy Torrance, popped the lid to take a look, and drafted the following discussion (which, amongst other things, raises the perennial question for us reverse engineers – how do you define a process node in real terms?). Now read on.. The first thing we did was measure the die size. This chip is 35 sq mm, compared to the previous generation 48-nm Samsung 1Gb DDR3 SDRAM, which is 28.6 sq mm. Clearly this 2 Gb die is much smaller than 2X the 48-nm 1 Gb die, so our assumption that we have a 3x nm part looks good so far. 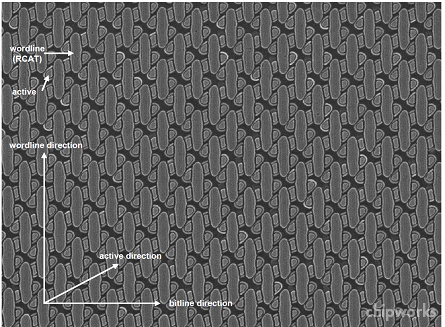 Next we did a bevel-section of the part to take a look at the cell array. We were surprised with what we found. The capacitors are laid out in a square array instead of the more usual hexagonal pattern (see below), and the wordline (WL) and bitline (BL) pitches are both about 96 nm. The usual method of determining DRAM node is to take half the minimum WL or BL pitch. That places this DRAM at the 48-nm process node, the same as the previous Samsung generation of 48 nm. So why does the die size look like it should be a smaller technology? For this we need to look at cell size. 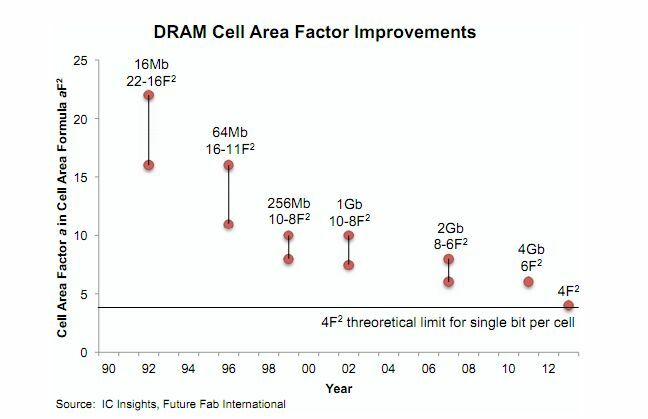 The 48 nm SDRAM has a cell size of ~0.014 sq µm. 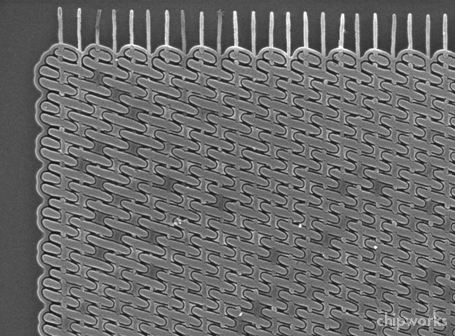 This new SDRAM has a cell size of 0.0092 sq µm. 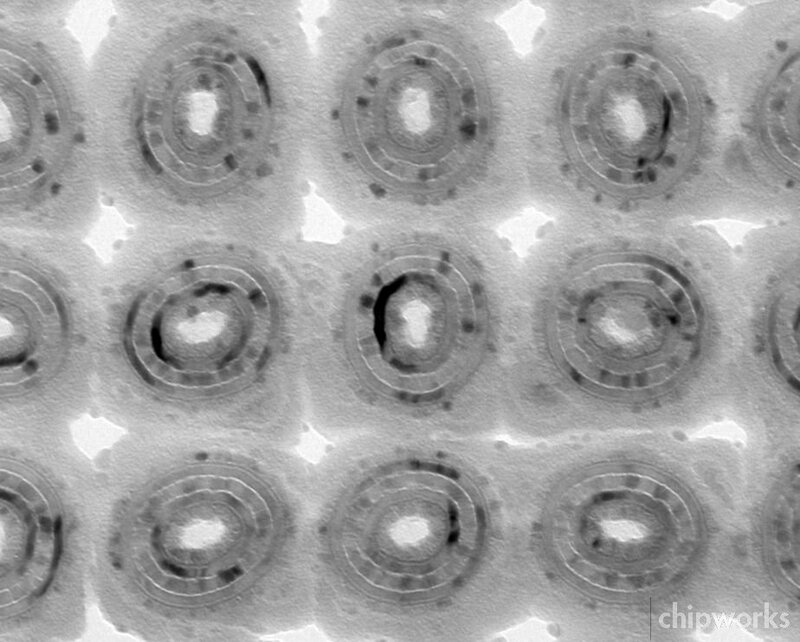 Clearly this cell is much smaller than the 48 nm generation. If we take the half-WL pitch as the minimum feature size (F), we get an F of 48 nm for this process. The cell area of 0.0092 sq µm is exactly 4 x F, squared, 4F2. Is this the world’s first 4F2 cell? From this point of view it certainly appears so. The cell is four times the size of the minimum feature, squared. But, there are other ways of looking at this. A 4F2 architecture is defined as having a memory cell at each and every possible location, that being each and every crossing of WL and BL, with the cell being 2F x 2F. This is in fact what we see on this Samsung DRAM, so maybe we are looking at the first 4F2 architecture. But let’s look just a bit closer to be sure. 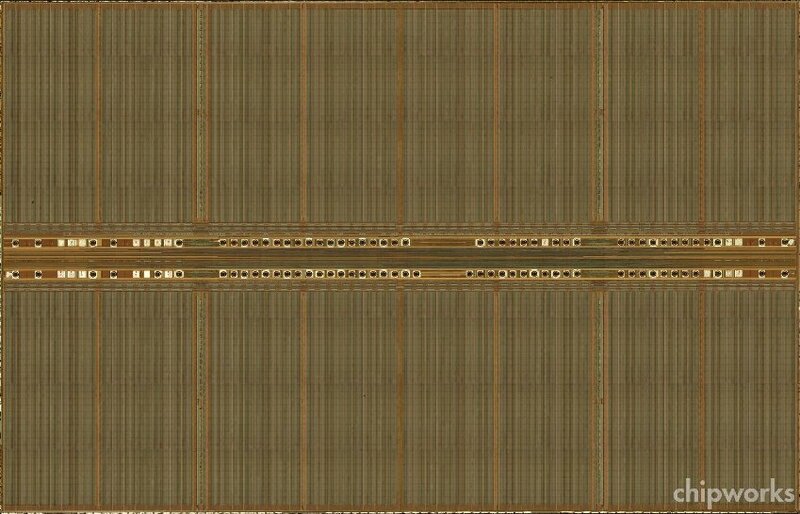 ï»¿ï»¿We compared the poly and active layout under the array between the 48 nm SDRAM and this new one. The images are shown below. As can be seen, both have very similar layouts. The angle of the active silicon (diffusion) direction is about the same. The active areas are ovals. Each diffusion has two wordlines crossing it. There is a gap between all the active areas, such that a third WL does not cross active on this diagonal active direction. This new DRAM clearly has a very similar cell layout to the previous one. In both cases the wordlines do not have a transistor under them at every possible location that a transistor would fit. Rather, one of every three possible transistor locations is filled with a break in the diffusion stripe. This is really a better definition of a 6F2 cell, since in a 6F2 architecture 2/3 of the WL/BL intersections are filled with storage cells. As we noted above, a 4F2 cell really should have transistors at every possible transistor location. When we look at the pitch of the diffusions in this new DRAM, we see it is much tighter. In fact, along the WL direction the diffusion pitch is now 64 nm, whereas in the 48 nm SDRAM this pitch was 96 nm. So if you take half the minimum pitch in the chip as the node, this is a 32-nm part (ITRS 2009 still defines F as half the contacted M1 pitch, which would be 48 nm). So, do we have a 32 nm node, and a 6F2 architecture? Maybe. The only issue is that if we use 32 nm as F, then when we plug that into the 6F2 equation we get 0.0061 um2 as the cell size. However, the cell size is actually 0.0092 um2. If we use that number and use the equation to calculate F we find that F=39nm. Soâ? ?¦ do we call this a 32 nm or a 39 nm node? It depends how you calculate it – either way it’s a 3x! So, although it’s a little disappointing that I don’t think we can announce the worlds first 4F2 DRAM, we can announce the worlds smallest node, 32 or 39 nm, production 6F2 DRAM. Our up-coming reports will give many more details on this fascinating part.